Online review sites are great for finding restaurants and vacation spots, but they may not be the best way to pick a doctor, according to a new study. In fact, the study says they might be the worst way to look for a top-rated specialist. 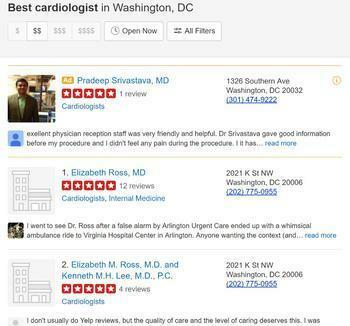 The survey found that the vast majority of top-rated specialty physicians on Yelp, Vitals, and Healthgrades aren’t the highest ranked physicians when it comes to examining actual performance data related to their medical specialty. The researchers identified the top 10 ranked physicians across five common specialties in New York, Chicago, and Los Angeles on the three popular patient review websites. They then compared these lists to a list of the 10 physicians with the highest quality scores (by specialty) in these same cities. The study then compared those rankings with actual physician performance on variables including patient readmission rates, surgical infection rates, average length of stay, procedure volume, and patient outcomes. The findings: only 2 percent of physicians who showed up as top 10 ranked on the popular websites also showed up as top performers when examining actual quality metrics. Hines noted that online patient reviews typically focus on attributes like a physician’s bedside manner and availability, as well as other factors like the location of the office and punctuality in scheduling. Several studies show that most consumers aren’t fully aware that physician quality matters and varies significantly depending on specific skills, experience, and a variety of other factors. Patients like online doctor reviews. Doctors? Not so much. Can real doctors match online diagnosis?